Don’t know your tinga from your tomatillo? Long, red and very hot. Cooked to perfection with onion, epazote and seasoning. This smoked jalapeno pepper is an absolute staple of Mexican cooking. A Mexican herb that adds depth of flavour. Combination of avocado, onion, serrano chiles, sea salt, coriander and lime juice. Fiery, intensely-flavoured chile that adds a real kick to our delicious habanero salsa. Simmered with chorizo, onion and oregano for extra flavour. A hot, green chile that turns red, then yellow as it ages. Tinga chicken is shredded and simmered in a rich chipotle sauce. Looks a little like a green tomato. Adds a tart tang to our signature salsa verde. El Criminal, our biggest, hottest burrito ever, is released! 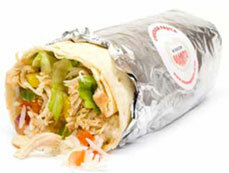 Pre-order your burritos online and go straight to the front of the queue to pick up your food. Subscribe to our newsletter, click the link below!